Dear Poto, what a beautiful shorthair girl you are. Your coat looks so soft and shiny, and your face is adorable. I sure can see a hint of mischief in it! I love your photos, especially your baby pic in which you do like an angel. You have proven that the tiniest kitty can take over a house, including a huge Rottweiler. You even turned your dad into a cat person. Probably your greatest achievement. You are even a favorite at the vet's office. You and your family share so much love and joy that they can't imagine life without you. Poto, you are precious beyond words, and I wish you, your doggie sibling and your parents a great day full of celebration, and many more happy and healthy years together. Hi Poto! Happy Cat of the Day! What a gorgeous Tuxie girl you are, Poto, pawsitively pawsome, inside and out! And just as your mommy says, you sure know how to work the camera! (That top photo is mesmerizing! ) And rumor has it, you're every bit as packed with purrsonality as you are gorgeous good looks; your antics and mischievous ways, your divaness, your take charge catitude charming even the vet (if not your Rottie sib)! And so, it's no surprise to learn how handily you wormed your way into your humans' hearts, Poto, even turning your daddy into a cat lover for life! How lucky your furever family is, having a beautiful, fun and life loving, sweet as can be best furkid in you, Poto! You're simply the best, the poster girl for kitty adoption, a treasure! Thanks for the BIG smiles, Poto! Meeting you this evening has been a real treat! I hope you're enjoying a very special Cat of the Day celebration...being loved and pampered to pieces by your proud pawrents, treated to all your heart desires and more! 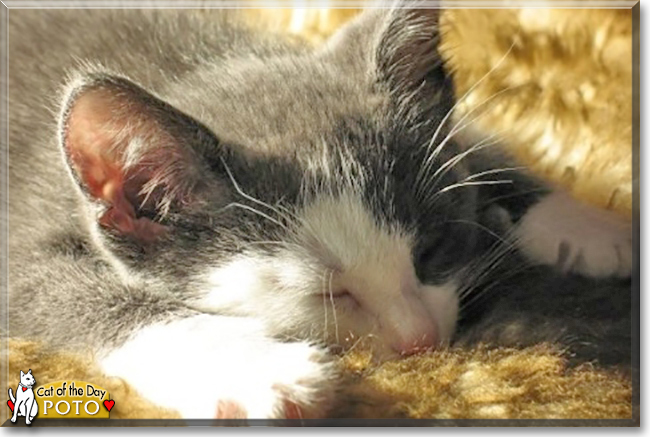 Lots of love, cuddles and kisses to you, precious Poto, our very special and most deserving Cat of the Day, EVERY day! Love to your dear Rottie sib, too! Doing my best angel impersonation!!! Dearest Poto, a.k.a. Phantom Of The Opera, what an adorable lady you are! You are such a pretty Tuxedo girl, with that soft-looking fur in the most interesting design and that sweet face with the cute pink nose and the long, LOOONG white whiskers and that little beard under your mouth and those lovely big pale-green eyes. Thank you for sharing those great photos with us! That first one is amazing, quite striking, the two middle ones show you beautifully in different moods, and then, what a precious little kitten you were! (You're still precious, of course .) I wish I could reach through the screen and all the way to Anchorage, Alaska to pet you, and pet your Rottie buddy, too! I can't, of course, but I know your loving and beloved Purrrsons will pet you for me . And what a delightful Purrrsonality you have! Your special gift is making everyone love you. Right after you first came Home, you took over the house and in no time converted your Dad into a "Cat Person." At first you terrorized your 85-pound Rottweiler housemate, but since then you two have learned to coexist. Your vet also loves you and after each visit goes on to tell the entire staff how your fur is like a rabbit's and what your name means. Your dear Purrrents love you very much and cannot even imagine their house without you or remember what it was like before you came. What a wonderful love-filled home you share! 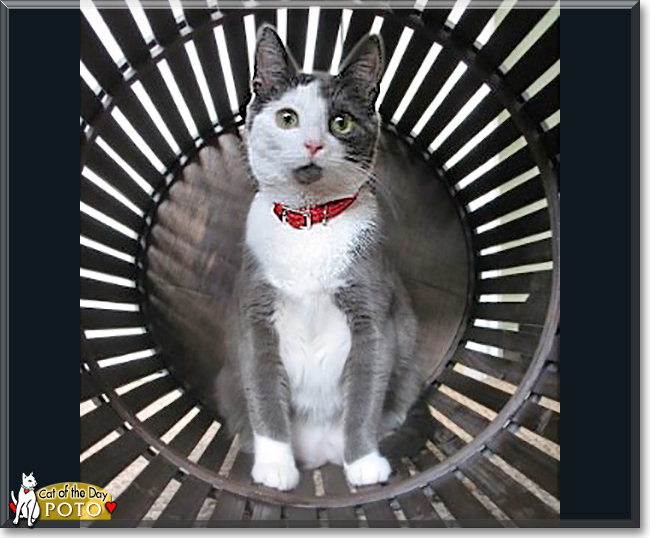 Congratulations, darling Poto, on being chosen today's Cat of the Day! We hope you and your dear Purrrents and Rottie pal and all your family and friends are enjoying a fine celebration, full of fun and lovies and all your favorite games and treats. Last edited by phesina; 09-11-2018 at 08:32 PM. Hello, Poto in Alaska! Happy Cat of the day! What a lovely kitty you are in your grey and white tuxedo! I like your morning coat, your cute pink nose, and your white gloved paws! Your fur looks so soft- I would be glad to pet you! Since I can't, though- I hope your people will give you lots of pats and snuggles for me. You were a tiny kitten - but you won over your dad, and your Rottie buddy too! You have just the right amount of cat-itude! PURR-fect! Best of all, you are a greatly loved kitty, so much so that your people can't imagine the house without you! Happy, happy Cat of the Day to sweet Poto! What a beautiful Tuxie you are, Poto. Congrats on being COTD!